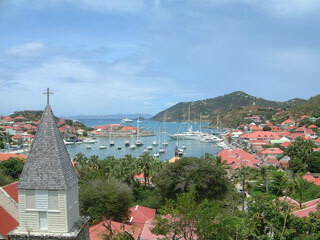 Saint Barthélemy was first claimed by France, in 1648. The island was given to Sweden in exchange for trade rights in Gothenburg in 1784 and Sweden founded the Swedish West India Company. Prospering during the Napoleonic Wars, assets were low thereafter, and the island was sold back to France in 1878. The eventual site of Gustavia was first called Le Carénage after the shelter it provided to damaged ships. According to the archives the name Gustavia appeared between December 28, 1786 and February 9, 1787. Gustavia remains as a reflection of the Swedish period. This article uses material from the Wikipedia article "Gustavia", which is released under the Creative Commons Attribution-Share-Alike 3.0 License.